Nine environmental protesters were arrested Saturday after staging a die-in at the Rink at Rockefeller Center and unfurling a banner on the iconic statue of Prometheus overlooking the ice, police sources said. Eight people were charged with disorderly conduct and one with reckless endangerment, the sources said. One protester scaled the golden statue of the Greek god and covered it with a banner that read in part: "Climate Change = Mass Murder" and "Rebel for Life." The protester climbed down into the water of the fountain under the statue and was quickly apprehended by police. 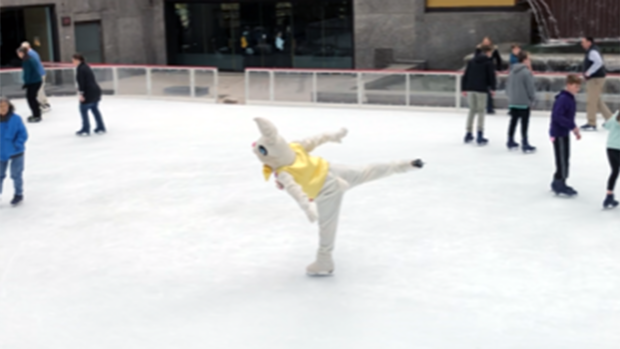 The Easter Bunny struts his stuff on the Rink at Rockefeller Center. Other protesters laid down on the ice in a circle with more laying inside the circle. The action preventing skaters from going around the rink. A group called Extinction Rebellion posted plans for a march and a "disruption." The group's website said Saturday was the US National Rebellion Day. The group's Facebook page said the protest was for "a livable future for us and our children." The Prometheus statue, made in 1934, is said to be the most photographed monumental sculpture in New York City, according to the Rockefeller Center website.